One of the things I really like about knitting and crocheting is that they don't require a lot of complicated tools. 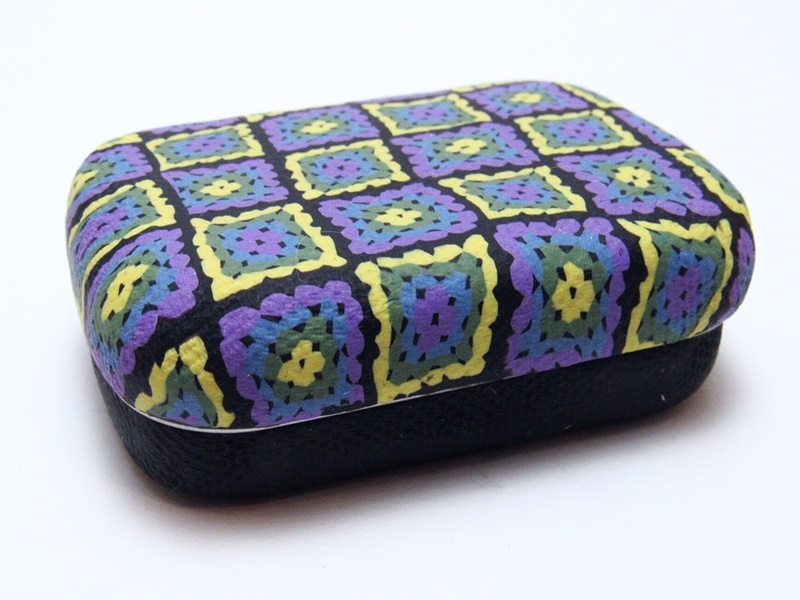 Of course that doesn't mean you can't enjoy some pretty tools while you stitch. This month I'd like to introduce you to my friend, Noelle from www.noellelewisart.com. She recently added a new collection of handcrafted knit and crochet tools to her shop that you will definitely want to get your hands on. I'm Noelle, an artist/crafter from California. I've been creating since I was a little girl, from markers and beads to paint and clay. I started an Etsy shop shortly after high school, which grew very slowly while I worked and took college classes. Then I spent a lot of time developing my skills during my husband's deployments with the Army. Now we live a pretty quiet life with our two cats in Tennessee, where he runs a gym and I've started a website. My work continues to evolve over time, but I mostly make paintings and jewelry. My paintings are acrylic on canvas, usually realistic landscapes, ranging in size from miniature to large. 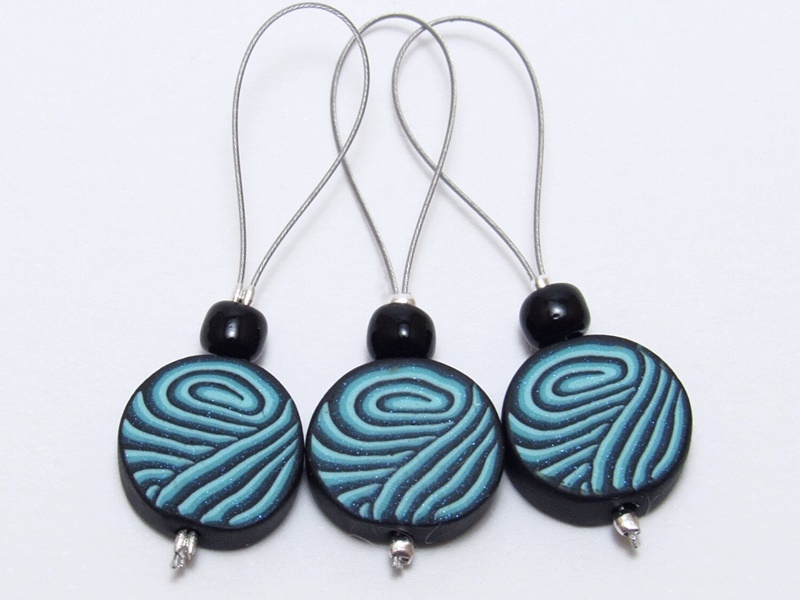 I make my jewelry with polymer clay, a durable and colorful medium with almost infinite possibilities. 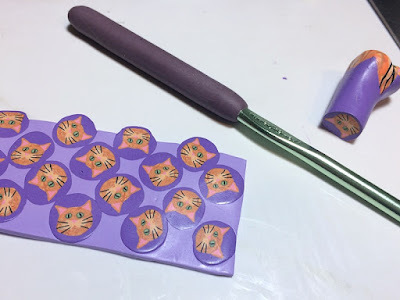 My favorite technique is probably caning, a method of piecing different colors of clay together to create an image, which is then reduced, sliced, and used for various projects. 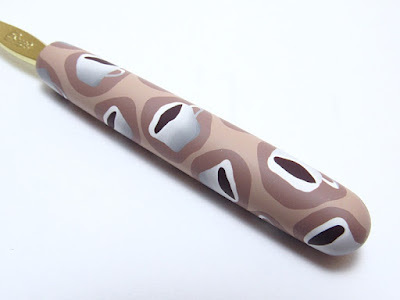 Because clay is so versatile, I can also use it to make other items like home decor and crafting tools. Visually, I am inspired by my favorite things in nature. We have lived in some beautiful places, and looking at the trees or the mountains or the stars makes me want to create beautiful things. I'm always taking pictures of interesting flowers and animals too, and it's fun to get ideas from what other people like. Personally, I am inspired by my favorite stories - I'm a big fantasy nerd - and real people who pursue their passions, whether they're people I know or the great artists, thinkers, and entrepreneurs of the past. I generally start my day with catching up on chores, going for a walk, or maybe getting some projects started. But I'm a night owl, so after dark is when I really get going. That's when I tend to work on orders, new product designs, and updating my shop and website. Working on creative projects every day keeps the ideas flowing, but sometimes I need breaks too, so I like to watch Netflix at the end of the day. It started with a suggestion to make some sheep stitch markers, since I was already selling sheep earrings. 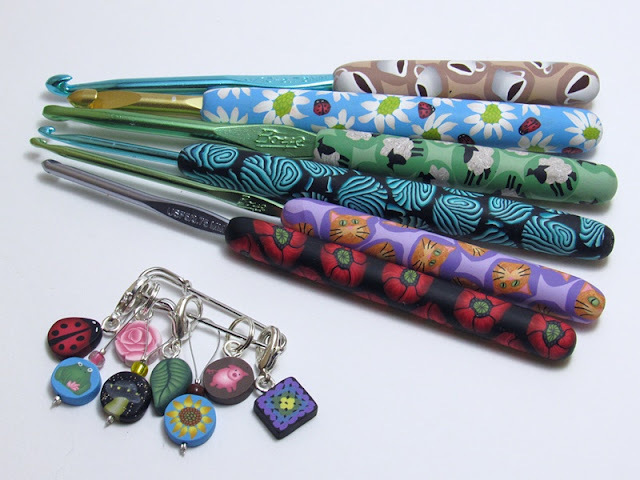 I ran with it and ended up making several sets of stitch markers and crochet hooks, and even some little storage tins. Some of the designs are inspired by knit and crochet slang, some have classic yarn themed patterns, and some are just cute and fun. I've improved my sanding skills to make sure the hooks are smooth and comfortable to hold. Each item is designed to be both beautiful and useful. Yes! I love working with customers to create something special I might not have thought of. I can make changes as simple as color and size, or as complex as sketching up a whole new design. Knitters and Crocheters - You'll definitely want to get your hands on these coordinating stitch markers, storage tins and hooks from Noelle Lewis Art.